Starter motors are series-wound; i.e., they are wound so that current enters the field coils and goes to the armature through the insulated brushes. Because a series wound motor is characterized by high no-load rpm, some manufacturers employ limiting coils in shunt with the fields. The effect is to govern the free-running rpm and prolong starter life should the starter be energized without engaging the flywheel. The exploded view in Fig. 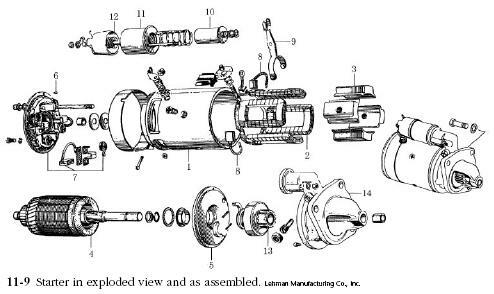 11-9 illustrates the major components of a typical starter motor. The frame (No. 1) has several functions. It locates the armature and fields, absorbs torque reaction, and forms part of the magnetic circuit. The field coils (No. 2) are mounted on the pole shoes (No. 3) and generate a magnetic field, which reacts with the field generated in the armature to produce torque. The pole pieces are secured to the frame by screws. The armature (No. 4) consists of a steel form and a series of windings, which terminate at the commutator bars. The shaft is integral with it and splined to accept the starter clutch. The end plates (5 and 6) locate the armature by means of bronze bushings. The commutator end plate doubles as a mounting fixture for the brushes, while the power takeoff side segregates the starter motor from the clutch. The insulated (hot) brushes (No. 7) provide a current path from the field coils through the commutator and armature windings to the grounded brushes (No. 8). Engagement of this particular starter is done by means of a yoke (No. 9), which is pivoted by the solenoid plunger (No. 10) in response to current flowing through the solenoid windings (No. 11). Movement of the plunger also trips a relay (No. 12) and energizes the motor. The pinion gear (No. 13) meshes with the ring gear on the rim of the flywheel. The pinion gear is integral with an overrunning clutch. The starter drive housing supports the power takeoff end of the shaft and provides an accurately machined surface for mounting the starter motor to the ending block or bell housing.